Full back Stephen Ward stepped up his comeback when playing 75 minutes for the Under-23s in defeat to Huddersfield Town. The Republic of Ireland international has been sidelined with a knee injury since the victory over Stoke City at Turf Moor, missing nine games in the Premier League. The 32-year-old was withdrawn in the 41st minute against the Potters and was replaced by summer signing Charlie Taylor. However, the defender was unable to prevent another loss in the Professional Development League as Michael Duff’s side shipped three second half goals. The visitors had the chance to take the lead early on only for striker Ntumba Massanka to squander the opportunity from the penalty spot as goalkeeper Ryan Schofield guessed correctly. Massanka, who was fouled by Romoney Chrichlow-Noble inside the box, then had an effort cleared off the line by the same player. Dwight McNeill struck the inside of the post from a corner before Jamie Thomas had another attempt blocked on the goal line. The game turned just after the hour, however, when the Terriers were awarded a spot kick of their own. Rahis Nabi was the culprit as he brought down Lewis O’Brien and January signing Alex Pritchard converted. Clarets keeper Conor Mitchell had been a spectator up until that point but within a minute he was beaten again when Dominic Tear pounced. 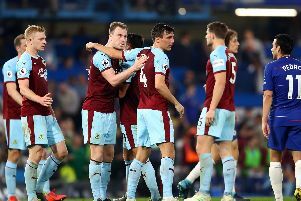 The hosts then added another with nine minutes remaining when Rekeil Pyke struck to leave the Clarets cut adrift at the bottom of the northern division. “It was a strange game. For an hour we were good and should have been comfortably winning the game,” said Duff. “It’s a lesson they’ve got to learn. You’ve got to be ruthless. I was happy for an hour and then the reaction and the way some of the lads sort of crumbled a little bit was disappointing.